What Conventional Doctors Should Know about Homeopathy? Homeopathy and the conventional medicine must be integrated. They must go hand in hand. What should 'your' doctor know about homeopathy? The doctors of conventional medicine are usually not trained to have a pragmatic view towards homeopathy. As a result, without their fault, many of the conventional doctors have a view on homeopathy which may be far from what is being called for. This is true with the doctors in most countries. The entire conventional medical training is centered on understanding more and more about smallest units of the human body. There has been a greater success than ever before. However, in the process, the totalistic philosophy is jeopardized. The conventional doctors are not trained to look around and incorporated the wisdom of another system of medicine. They are often ignorant about the fact that when conventional medicine was unpolished and cruel (late 18th century). That homeopathy took birth in Germany, introduced by the doctor of medicine at that time, who was frustrated of bloodletting and ill practice in medicine, which has now developed into the conventional medicine. In other words, the homeopathic education is not different than the conventional 'medical' education, except for the line of treatment. That homeopathy is a different treatment modality, not different understating about the human body! Homeopathy works for chronic diseases, where conventional medicine has limitations. That disease investigational parameters are the same for the homeopathic science. That all forms of medical systems are nothing but parts of science viewed and applied in different manners. This is true with the conventional medicine and homeopathy. That surgery is also a part of homeopathy. Homeopathy is just a specialized medicinal therapeutics, whereby medicines are administered with a different philosophy while all other treatment modalities remain the same, which include investigations, diagnostic procedures (biopsy, MRI), surgical measures, medical procedures (dialysis, intravenous supplements, ventilators), and other supplementary therapies. Most conventional doctors do not study the fundamentals of homeopathy hence have no knowledge whatsoever about this faculty which has survived for over 210 years. As a result, they end up criticizing homeopathy without prior comprehension. That homeopathy is as faculty with great therapeutic scope, which is not yet a fully developed science. Anyway, which science is fully developed? Medical science per se is based on empirical know-how, to start with. The conventional doctors due to many reasons fail to gain experience using homeopathy. Any criticism without personal experience is bound to be groundless. Some of the conventional doctors who are either open-minded hence opt for having experience using homeopathic medicines, either for themselves or for their family members, end up having positive views. Those who do not manage to have the first-hand experience, end up missing out on the benefits for themselves, their families as well as for their patients. One will have experience either out of knowledge or need. If you know, you will make use of it. Some of the conventional doctors, who would have opposed homeopathy all life due to closed minded attitude, might suddenly come across a situation, where someone dear and near would need for alternative medicine for a disease not treatable using the conventional treatment. And the doors open forever. However, there are people, who keep the doors rigidly shut, and would never let open! In the age of information technology, the most pitiable state is to get information but still not try, out of prejudice. This is true with many conventional medical professionals, as the mindset is so prejudiced that they are just not willing to try new science. This is largely due to lack of exposure to homeopathy at the medical schools. So, how does it matter? 01 They do not guide their patients who need help for chronic diseases, where the conventional treatment would not work well. 02 When, simply due to ignorance, they discourage those patients who have done better homework about homeopathy, and are willing to opt for it. It is absolutely unwise to let billions suffer due to the ignorance of a million. Patients suffering from many chronic diseases all over the world remain deprived of the benefits of homeopathy, simply because homeopathy was not taught at the conventional medical schools. Misconceptions, ignorance, and bias about homeopathy can be detrimental to the patients who are treated by conventional doctors. The openness of mind is a solution. The conventional medical schools all over the world can easily integrate short courses (introductory and advance) as a part of regular training. Those who are already in practice could be exposed to homeopathy as a part of CME, continued medical education. This will help the physician in particular and the suffering of humanity in general. Till then, let us learn to keep our senses open. 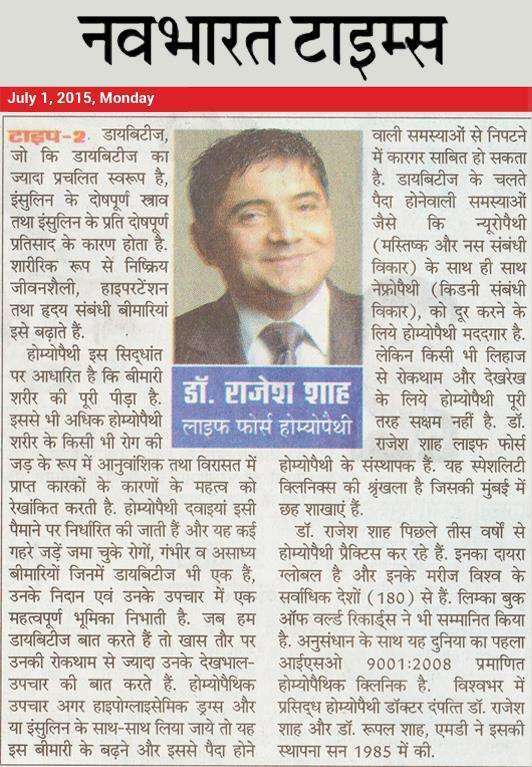 © This article is written by Dr Rajesh Shah, M.D., for the information of patients and conventional doctors.